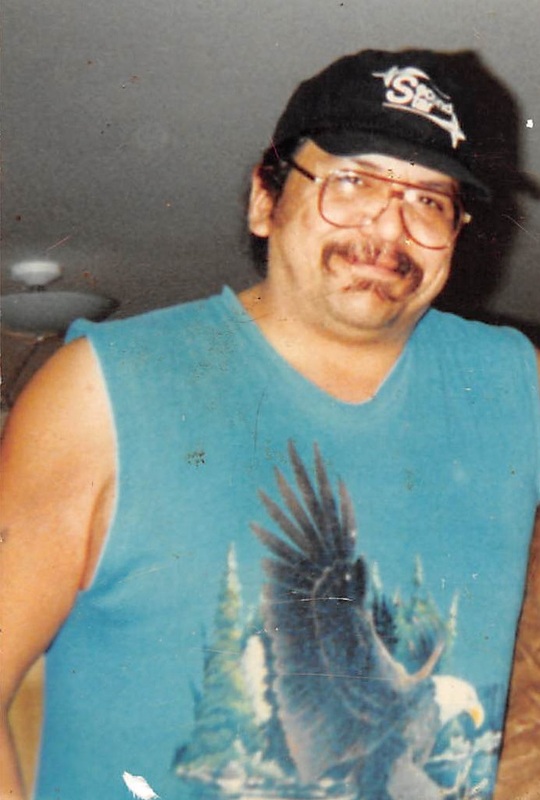 David Ricker passed away on Saturday, March 23, 2019 at NEMHS Trinity Hospital in Wolf Point, Montana. David was born to Magdaline Stretcheshimself–Snell and Harry Ricker on January 4, 1958 in Poplar, Montana. He lived his younger years in Oklahoma with his dad, then moved to Poplar as a teenager to live with his grandparents, Mildred and Ted Ricker, his aunt Faye, and his cousin Tonya Cain Ricker. He learned the trade of welding and did welding and various other jobs throughout his life. He was also good at quillwork and beading. He loved his native culture. He loved his family. He was very protective, supportive, and would do whatever he could for his family. He loved to tease, to spoil his grandkids, and loved cooking whatever they wanted for them. He would give up whatever he had for his family. Family was his life. Dave was close to his sister “Cookie” and her family, he helped raise her and his brother-in-law Monte’s kids. Dave, Cookie, and Monty were inseparable. He raised and loved his daughter Feather until she was about 10 years old. Dave was close to his oldest daughter Tara and her family, living with her throughout his life up to the day of his passing. Dave is survived by his daughters Tara (Robert) Douglas Ricker and Feather (Perry) Ricker; Grandchildren, Timothy Hotomanie, Lateshia Hotomanie, Tameka Azure, Aaliyah Baca, Angelique Guerro, Manto Guerro, Adrina Guerro, Jade Guerro, Alana Guerro, Jaime Guerro, Tyler Azure, and T’Shauna Azure; great grandchildren, Anthony Gray, Audrianna Hotomanie, and Aliyarose Hotomanie; children he loved and helped raise like his own, Larry Francisco, Clair Fourstar, Stephen Bender Jr., Monica Crowder, Gabe Growder, and Monty Crowder Jr.; brothers and sisters, Harriet “Cookie” Ricker Crowder, Jake Ricker, Joyce Ricker, Michael Ricker, Theodure Ricker, Angela Cheek, Juanita Snell-Conradt, Joanetta Snell, Corey Snell, Trudy Snell, Ted Darnell Sr., Ira Darnell Sr., Delbert “Thumper” Kennedy, Marilyn Duran, Joseph Kennedy Ricker, Angeline Ironcloud, Chris Jones, Sugar Jones, and Brian Jones Sr.; and his uncle and auntie, George and Helen Ricker. Dave is preceded in death by his mother Magdeline Stretcheshimself-Snell; his father, Harry Ricker; his grandparents, Theodure and Mildred Ricker; Aunties, Faye Ricker-Crowe, and Delores Ricker; Brother, Alex “Buttons” Snell; Sister, Karen Ricker Buckles; Brother-in-law, Monty Crowder Sr. If there’s anyone we forgot to mention, please forgive us. Dave loved all his family very much. Dad- Thank you for always being there when we needed you. You were our protector, supporter, and always saw the good in all the bad. You always stayed positive and had a smile or a joke. You are going to be missed but we know we will see you again one day. Until then, watch over us, guide us, and whisper “everything will be ok.” Love you Dad/Grandpa. Love your kids, grandkids, great-grandkids, and the rest of your family. Clayton Stevenson Memorial Chapel has been entrusted with the arrangements and condolences for the family may be left using the form below. We had a lot of great good times together. Thank you for raising me as a kid to the adult I am today and the many lessons you taught me to be a good man. I will miss u forever until we meet again.. Fly high fly free..
Rest easy big cousin & hug my baby’s for me, until we see each other I 💘 love you! !